A table for two is set in the dark space. It is covered with a white table cloth. A vase with flowers is placed in the middle. A video projector fixed on the ceiling exactly above the table projects the image onto it. 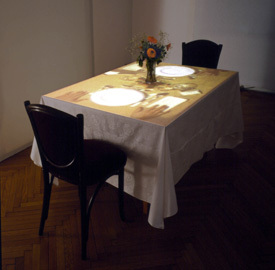 Video shows a couple at the dinner only the hands and gestures of man and woman are visible within the frame of the table/screen. Viewers may take the seat at the table.